POSTED April 4, 2019 12:42 p.m.
MADISON — The first Wisconsin Civics Games in the State Capitol Friday turned out to have many similarities to a sporting event. There was an early loss and required comeback to advance. There was strategy, some of which paid off, some of which backfired on a team. And of course there was an overall winner. Platteville High School’s team — seniors Liam Reinicke, Spencer Olds and Alex Sonsolla and junior Jacob Sherer — won the first Civics Games with a 9–7 win over Northland Pines in the semifinal and a 6–3 win over Muskego in the championship. 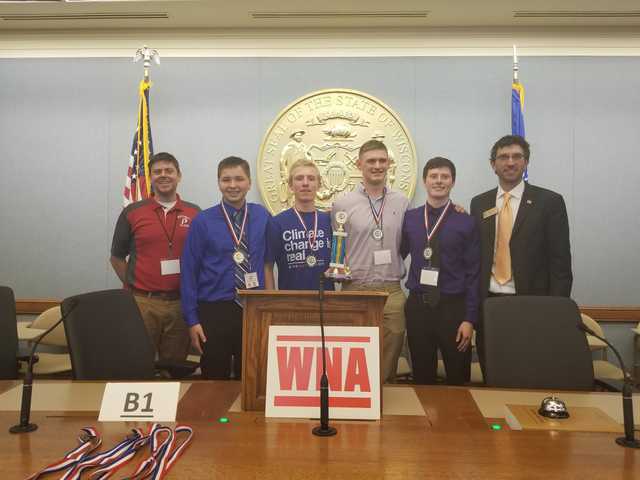 The championship earned the four $2,000 scholarships to a Wisconsin college from the Wisconsin Newspaper Association Foundation, which put on the event, and the answer to the future trivia question of who won the first Civics Games. Those responsible for the win deflected the credit for the win. “We have a great history department, and that really got me interested,” said Sonsalla of teachers Garrett Jones, Brandon Pink and Jacob Crase. “The real key to our success was a lot of teams had one kid that answered about 90 percent of the questions, but we had depth and we had four who could answer questions,” said Sherer. The four were selected from 16 PHS students who participated in a schoolwide Civics Games. All 16 signed up before the WNA announced the $2,000 scholarships to the state winners. Platteville won the UW–Platteville regional Feb. 2 to advance to state, along with regional runner-up Cassville. The finals were rescheduled from Feb. 23 due to bad weather. One question was about the tallest building in Madison — the building in which the competition took place, the State Capitol. Another question asked about people who were both governors and U.S. senators — “Fighting Bob” La Follette and Gaylord Nelson. State Rep. Travis Tranel (R–Cuba City) asked the questions. Tranel also assisted his constituents by sending them copies of the Wisconsin Blue Book, which contains nearly every piece of information that exists about state and local government. “After that first round, we thought it was going to be a long day,” said Sherer. The team rebounded from the worst loss of the first round to the biggest win of the first round, 16–2 over Black River Falls. “We kind of walked away with that one,” said Sonsalla. The team won one question by answering the question with a definition — erasing a person’s criminal record — instead of the correct word, expungement. “They accepted it previously, and my mom spoke up, so they accepted it,” said Sherer. That created a three-way tie for first, and gave Platteville the third seed and a semifinal matchup with second-seed Northland Pines, while Memorial, which blew through the preliminary round like the 2015 Kentucky men’s basketball team blew through the NCAA tournament to the Final Four, got the number one seed and a semifinal matchup with Muskego. The 2015 Wildcats and 2019 Spartans had one thing in common — they both lost in the semifinals. Platteville, meanwhile, squeaked past Northland Pines to win the semifinal. The competition was shown live on WisconsinEye, and was watched in several PHS classrooms, including the final. Sonsalla said a Muskego competitor would ring fast and then take up to 30 seconds to answer the question. “We pulled ahead and they came back, and then we got ahead and won,” said Sonsalla, who compared the pressure of the final to an FFA parliamentary procedure competition. “We got up pretty early, but we thought they would catch up, but we managed to hold on, which is pretty cool,” said Olds. Sherer said the clinching question was what food was legalized in Wisconsin in 1967. “When the kid from Muskego guessed Spam, we knew they couldn’t get past us,” he said. The correct answer: Colored margarine. “My mom always called me a little politician,” said Sonsalla, who will attend UW–Platteville in mechanical engineering but is interested in running for office someday. His grandfather is a Darlington alderman. Reinicke plans to study political science and history in college. “I wouldn’t mind getting involved in political groups,” said Olds, who plans to study nursing in college.